Robert Lewandowski’s clever flick put Dortmund six points clear of Bayern – probably a decisive lead at the summit of the Bundesliga table. Jupp Heynckes was without Bastian Schweinsteiger, so Luis Gustavo partnered Toni Kroos. In defence, Philipp Lahm was over on the right, with David Alaba at left-back. Dortmund dominated the first half but didn’t score – then looked nervous in the second and did score. 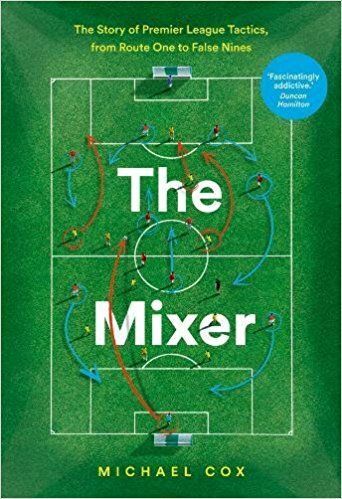 The first six or seven minutes were played at a very high tempo, with both sides excitedly closing down and getting the ball forward quickly. When the game settled down, it turned out that Dortmund weren’t going to press particularly heavily from the front – they tended to close down with one attacker at a time, force Bayern to switch the ball to the opposite full-back position, and then drop into shape. 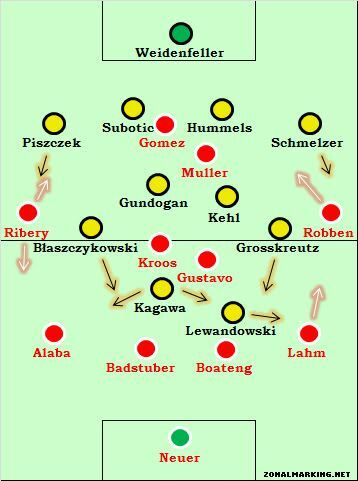 Bayern’s approach was largely the same – they tried to remain compact, as both Mario Gomez and Thomas Muller dropped off when out of possession, getting into a position between the Dortmund centre-backs and holding midfielders. Both centre-backs had plenty of time on the ball, and though both sides tended to play short passes, Dortmund hit a couple of longer balls to Robert Lewandowski, who nodded down to Shinji Kagawa. Kagawa was probably the key player in the first half, the most intelligent with his movement and appreciation of space. He tended to play to the right of the pitch, exploiting a little pocket of space when Kroos moved higher up than Gustavo. He picked up the ball in that zone and looked dangerous. Dortmund also did well to bring their wide players inside and make runs from the channels in behind the defence. With Lewandowski often coming deep and pulling the centre-backs out of position, there were opportunities to get the wide players into good situations. Jakub Blaszczykowski found himself with a good early chance from a narrow angle wide on the left, having made an excellent diagonal run. That summed up the movement inside, and the full-backs motored on down the flanks well. Bayern struggled for sources of creativity early on. Franck Ribery was often intelligent with his movement, drawing Lukasz Piszczek up the pitch and creating opportunities for movement and variation of positions elsewhere, but when Dortmund got men behind the ball, Bayern looked slow in possession. Things got better when Kroos moved forward into the final third to create a little more, but their most promising move of the first half came from a direct break after Piszczek conceded possession cheaply on the right wing, with Ilkay Gundogan ahead of the ball and in no position to cover. That almost got Mario Gomez in, but overall he Gomez a poor game, and both he and Muller were substituted in the second half. In fact, Gomez came off very badly from the direct comparison to Lewandowski. He didn’t hold the ball up as effectively, he did work the channels as frequently, and he didn’t win as many aerial duels. Mats Hummels was a key reason for that, and was probably the man of the match. The strange this about this match was the timing of the goal. Dortmund had been by far the better side in the first half but failed to take the lead – then Bayern were marginally better in the second half, but Dortmund got their winner while looking more likely to concede. There was no obvious reason why Bayern stepped it up after the break. Dortmund became a little more cautious – although whether this caused, or was a result of, Bayern’s good spell is questionable. Kagawa was certainly less of a force and seemed to tire quickly; he played much deeper and was given some level of responsibility for picking up Kroos. This isolated Lewandowski, although he moved over to the left and still tried to bring the centre-backs out of position. Jupp Heynckes chose to introduce Schweinsteiger after an hour, with Muller departing and Kroos moving into the attacking midfield position. He sent a great ball in behind the defence for Ribery, and Bayern looked stronger after the change, even though Schweinsteiger didn’t look 100% fit. The other substitutions all seemed to be about fitness rather than to change things tactically, although Ivica Olic on for Gomez showed how disappointing the latter had been. Dortmund didn’t do anything special in the second half to merit their victory tactically. Indeed, it was Bayern who created more promising situations in the box, and missed a penalty after Robben was brought down. One feature of the second half was how much more Robben looked to come into central positions – where he was more dangerous than Muller or Gomez. This wasn’t an especially tactical game. 4-2-3-1 v 4-2-3-1, no real surprises nor dramatic changes from the coaches, and basically a game where Klopp and Heynckes believed their side could outplay the other. In a very open, pure game of football, there were no yellow cards, and a positive feel about the contest. But it was Dortmund who produced more good moments – they were more cohesive and able to attack in a variety of situations. Bayern actually dominated possession quite clearly (58%), but in Lewandowki and Hummels, Dortmund had the two star performers at either end. not sure, if you’re aware of the dortmund-schalke rivalry, it’s pretty much the fiercest there is in germany. now add to that the fact that neuer was not only a player for schalke but actually used to be a member of the “schalke-ultras”. i think you’ll be a little more understanding about the situation. the bananas that were thrown at him at the beginning of the second half were somewhat a reference to past years when “monkey” kahn played for bayern and the banana-thing became kind of a tradition. As long as its not coconuts, its ok!!! Manuel Neuer looked actually flattered and amused when all the bananas were lying around. To get the same attention as Oliver Kahn is high praise. And Neuer did his job well yesterday, too. I was watching this game with some friends who dont follow much german football apart for knowing a few big names and most of them didnt know anyone save Subotic (its a sore point in the US because he could have been the CB for the national team but the idiots in charge of the youth national team didnt think he as good enough for the U-19, then end up blasting him in the press just to make sure he didnt forget waht they thought of him. Two years later he is playing in Germany, three years later he is a star. The idiot in charge then went on to American Samoa and then to Toronto FC which is really the same thing). Needless to say, they were very impressed by the game I forced them to watch (I brew my own beer so it was worth the risk for them!) Im happy the game turned out this way: you couldnt ask for a better introduction to Bundesliga football. Couple questions (not for ZM just for anyone who knows), will Bender most probably be inserted straight back into that team when fit? If so, would Kehl or Gundogan drop out? I’ve only seen a bit of him but I would have thought Gundogan is too good to drop, no? Also, whats the general feeling of Alaba in Germany? Thought he’s looked quite bright on the left when i’ve seen him, though I’ve heard he’s not a left back. Cheers in advance. Quality work as per Michael, always an informative read. Alaba has played extremely well this season in my eyes. He is not spoken about alot in the german media because there are so many other great talents in germany but he will have a great carreer. The amazing thing about him is that at such a young age (I think he is 20) his positioning is superb on multiple positions. He has played as a DM/CM in a 4-2-3-1 for Austria most of the times (He also is Austria’s footbal-player of the year) and also for Bayern the first few games since Schweinsteiger’s injury (today Kroos played there) and has played pretty well there, too, but his build-up play isn’t good enough for that position (yet). He can play as a left- and a right winger, too. Like I said he has played terriffic as a left back throughout the last weeks, but I don’t see that as his best position for the future, because his good understnding of the game and his technical abillities aren’t needed there. I think his best position would be in a 4-3-3 as the left central midfielder with a role similar to Ramires’ role for Chelsea under Vilas-Bolas. (Defending, then motoring forward and also drifting to the wing) So he wouldn’t have the build-up responsibilities but could use his defensive skills, his strong body, his technical abilities and also his great speed and endurance. Cheers for that, wasn’t aware of a lot of the points you noted. I understand what you’re saying about a Ramires-type figure pertaining to Alaba too, I thought that the other day when watching a clip of him getting up and down the pitch. Looks quite the athlete. Cheers again. Some similar points with ZM, some different but still worth a read!! As most other countries the news focuses more on national talents and established foreign stars, alaba is austrian. if he would be german the media would hype him as the new big hope on the left side. good for him not being overhyped, shame that he cant play for germany. While not being hyped he gets lots of attention recently because everbody can see he has got world class potential. And in football circles he is considered to be the biggest talent after Götze in Bundesliga. This guy is 19 and plays stone cold with great technique and strength. A pleasure to watch. As you (Michael) are such a fan of Pirlo I want to know what you think of Toni Kroos. I think right now in the Bayern system there isn’t the right position for him. I think a 4-3-3 would suit him much more. But the idea I had is that his Situation (because there is no position really suited for him) is pretty similar to Pirlo’s early in his carreer. He has great technichal qualities to play difficult passes (long and short) great view for the game but has problems with his athleticism (in terms of speed, endurance, power…) and when he is pressured too much (especially with his back to the opponent’s goal). I think he could play the Pirlo-role really well because he would sit deeper, could see more of the field and wouldn’t need to be as dynamic as he needs to be in a 4231. Am I overrating him with this comparison? A possible midfield for Bayern in the future (In respect to what I said about Alaba in the respond to Elliot, also) would then be Kroos with Alaba too his left and Schweinsteiger too his right. This would create a very fluid and variable midfield which easily could outplay Dortmund’s pressing for example. i would agree that Kroos is most suited to be a deep-lying playmaker. He has good but not outstanding vision and is not mobile enough to be a world class No10. He also is not very dangerous inside the box so it makes sense to play him deeper. And with Schweinsteiger in the game yesterday Bayern were playing more like a 4-3-3 with Luiz Gustavo often ahead of both Schweinsteiger and Kroos. I totally agree, Kroos would do a lot better in a three man midfield! Man, that app with the runs the strikers made is awesome! I’ve never seen that before. You can find it at bundesliga.de. Its interesting to look at the central attacking midfielders (Muller and Kagawa). Neither really fits the stereotype for that role (Muller is not a great passer, and both tend to play higher up the pitch) making the sides at times (especially here) look as much 4-4-2/4-4-1-1 as 4-2-3-1. It makes wing play all the more important (especially for post-Sahin Dortmund). Bayern’s problem was evident last night again. They cannot create anything down the middle, when Mueller is playing in the hole and Gomez plays as centre-forward. Both are awful with their backs to goal. You almost never see a pass from the central midfielders into the feet of one them, as neither likes to come deep and even when they do they tend to lose possession quickly. That means that the opposition does not have to worry about covering the middle as much and can focus on doubling (and even tripling) up on the flanks to stop Robben and Ribery. Great analysis ZM! Lewandowski is really surprising this season, playing well and scoring more than ever. What a great transfer he turned out to be! I have only one addition: I think bringing on Schweinsteiger for Müller was a better move by Heynckes than you make it sound. If you look at the ten minutes after that, Kroos played a little higher up than before, but still much deeper than Müller in the central midifield position of the 4-2-3-1. It worked really well, suddenly Bayern had a spare man in the middle of the pitch, saw more of the ball in that area and created chances. However, Dortmund quickly adapted and I think Kagawa playing deeper in the second half was mostly a reaction to this. Apart from that, Heynckes didn’t seem to have any idea how to win this game. It looks like he has this one formation and hopes for the best. Quite disappointing! Not that Klopp did anything special last night, but Dortmund only needed draw, so a cautious approach is understandable. Yes it was very obvious. After the sub Bayern controlled the game because Schweinsteiger closed the channels in the middle very well and acted as a spare man like you said. I also found Heynckes very unispired, it seemed they not really had a plan. The only tactical change he made was obvious with Schweinsteiger. Klopp proved he knows how to beat Bayern in the last two years and knew in two 4-2-3-1 his side knows what to do. I personally felt that after HT Dortmund simply needed to find Kagawa more. Gundogan (71% passing accuracy) and Kehl (75%) were too wasteful with the ball and needed to use possession better in order to find Kagawa – by half-time Kroos had already made seven interceptions! Was impressed with Perisic when he came on – reminds me a lot of Boateng at Milan in terms of the role he performed. What’s Going down i’m new to this, I stumbled upon this I have found It absolutely helpful and it has aided me out loads. I’m hoping to give a contribution & aid different users like its helped me. Good job. I believe this game showed perfectly what Bayern really need to become a consistent and brilliant side: a deep-lying playmaker (a so called passer if you like) who will be able to play intelligent passes from deep to set attacks in motion,a more mobile, intelligent and probably quick forward who can deal with the challenge of a tall, strong defensive partnership and more reliant defenders (with the exception of Lahm who has proved how important he is for both Byern and Germany, although today they all played reasonably well) especially in the centre back positions-Badstuber and Boateng are great but not world-class yet (even Van Buyten could have helped more here mainly because of his experience). As long as Bayern tend to play a double-pivot denfensive midfield, they don’t need another ‘regista’. Registas you have in trivot or in diamond midfields. Schweinsteiger is able to play intelligent passes in such a way that vanGaal even put him to the number10 slot for various games in the 09/10 season. Bayern need another worldclass allround midfielder, as a replacement for Gustavo. They wanted Vidal but could not get him. Khedira would suit them, but probably Real won’t let him go. Agreed though about the central striker. Gomez is to immobile and does not have the feeling/understanding when to run where in order to help his team. vanBuyten won’t help Bayern much anymore. He is old, slow and immobile. Good in the air though. Most of all Bayern need a coach that is able to create a team that is more than the sum of the individual players. Somebody that practices collective moves, both in attack and defence, so that it’s not all about random strokes of genius by Ribery or Robben. Spot on but you are rather describing the way Bayern function now. I am suggesting how they should play in order to perform at full potential. It’s a pity so wonderful attacking players that Bayern have, don’t have precise delivery and assistance from the midfield. Schweinsteiger is amazing at times but with due respect, he won’t be able to play passes like Pirlo or Alonso and therefore that touch of genius that this kind of players can provide is absent. Agreed about the players you mentioned that Bayern need but as I’ve said they will only be back-ups to their current tactics (which have flaws). You are right about Van Buyten but that’s exactly my point. Even he could have helped more on that occasion. Finally, yes you are right about Heynckes but you can’t blaim him solely since Bayern tend to play a similar style of football with that of 2 years ago when they won the double and finished runners-up at the CL. They just hope it would work again (and suits them by the way). But generally you are right; they need a coach who can create new tactics that will work better. Bayern have atm two working central defenders (Breno and Buyten I don’t count anymore), which are good, but not world class. That’s too little, both qualitatively AND quantitatively, they need to go shopping this summer. I have to admit that I cannot really judge Pirlo, cause I hardly (can) watch any of his matches, but I have seen nearly each RealMadrid game this and the previous season, and believe me, Schweinsteiger is lightyears better than Xabi Alonso in basically each aspect possible (I am willing to detail, if demanded), including long-range passes. Alonso is not bad, don’t get me wrong, but overrated, I think. The main reason he is playing for Madrid is that he is (one of the few) Spanish, he is physical enough for Mourinho, and he is willing to sacrifice himself for the dirty work, that is, the organisational, defensive, tidy-up duties. Well I agree on the centre-back and shopping points (I’ve stated them too before) but not about the part on Xabi Alonso. It’s not just about accuracy and dynamic impact on the game. It’s the influence of a pure regista on the pitch. Alonso isn’t quite the best I agree. And Schweinsteiger can indeed develop his game in order to build on his playmaking skills. Schweinsteiger is superb and I’ve said above the same and that he is one of my favourite players. But they are incomparable in the “duties aspect” of their game. Schweinsteiger is a player who has more than a playmaking responsibility in the team and he has to be more complete in other aspects. Alonso is purely a passer. By the way there is no question who the better player is (Schweini of course ) but he can’t perform the regista rule as well as Alonso (overrated indeed but still precious) or any other passer that is clearly recognised as a regista. Thought Kagawa was excellent in this match particularly early on. His intelligent movement and touch provided a different quality between two sides playing similar formations. His play helped create an implementation of the 4-2-3-1 that was different from Bayern’s. Bayern are a terrific side. But fitting in Ribery,Robben, Muller and Kroos is somewhat complicated as they don’t exactly “fit.” When played centrally Muller almost functions as a shadow striker. This can leave gaps in space in the Bayern formation. I think they’d benefit from an additional orchestrating force in midfield, one who plays in front of Schweinsteiger (who is already asked to do so much…). Bayern are already so dynamic from the wings and effective/powerful centrally through Gomez that more of a playmaker would be beneficial to field at the “10″ position. Also- Michael -wonderfully informative graphic comparing Gomez and Lewandowski’s runs. Great example of how data analysis and visualization can add to our understanding of the game. Not sure of the source, but if possible would love to see more of this. Awesome graphic illustration on the runs made by the 2 forwards. How did you make that? 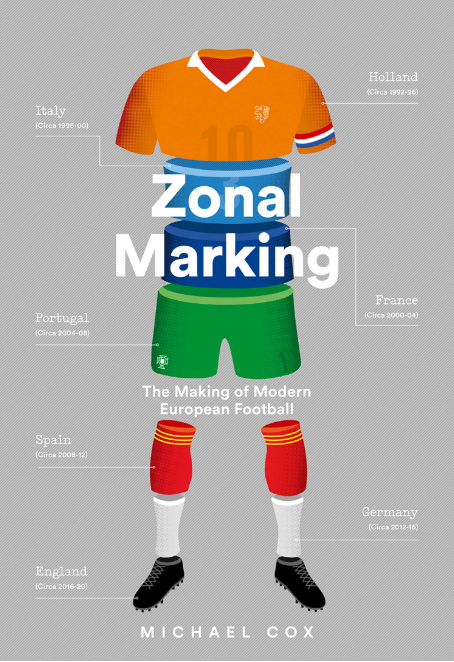 I think ZM got it from bundesliga.de. They have an outstanding statistic tool where you can display passes, tacklings and runs from any player. They even provide the speed of the runs. I’m very curious how Dortmund’s tactical shape will look next season. If you add Goetze and Reus to the eleven players of yesterday then the atticking force seems to become really impressive. OTOH you cannot play with 10 offensive midfielders. I would not be surprised if Klopp tries something like a 3-3-4 like it is played by Barca. Not having seen the game I’d assume both teams were facing each other in a 4-4-2, based on the diagram. After for years having 4-2-3-1’s being presented as 4-4-2’s, are we now getting the reverse situation? The problem is that teams have different shapes in defense and offense. Dortmund for example play a 4-4-1-1 in defense and go to a 4-2-3-1 on offense. And in transition the situation is even more complicated, because Dortmund immediatly presses against the ball instead of going back into their shape on defense and has almost basketball like running lanes on the counter attack. I would love to read more analysises of the Bundesliga! I watch both a lot, EPL and BL and i have to say that i get the impression that some BL sides are especially tacticaly way further than most of the EPL teams. Especially the high and constant pressing as a whole team from for example Dortmund, Gladbach, Hannover, Schalke etc doesn’t seem to be used that often in EPL and i get the impression that EPL teams run less as a team. can i get some statistics somewhere about it? Maybe i’m wrong, but thats just what i feel to have noticed in especially this season. In my opinion you could also see that at the two games of Manu vs Bilbao where Manu had no answer against the high pressing of Bilbao, maybe because they aren’t used to it from the EPL.